Vulkhel Guard circa 2E 582. Vulkhel Guard is a large port town located in the southern end of Auridon, in the region Iluvamir, southeast of Silsailen. 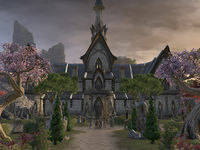 The surrounding nature, like the rest of the Isles, is a place of harmony and "from the tallest tree, to the shortest blade of grass", is in perfect balance by the local Altmer. Crystal blue waters surrounds Vulkhel Guard, and just east out of town, the beaches along the coast are some of the most beautiful and serene places one can find in all of Tamriel. The beaches around Vulkhel Guard have a lot of mudcrabs, which can do a great work for making a body disappear, so they are well-appreciated by the Dark Brotherhood. There are a few coves along the coast near Vulkhel, where locals collect clams and other shellfishes. It was neighbored by several settlements, one of them being Silsailen Point in the north. The South Beacon Lighthouse is located to the north of Vulkhel Guard, a charming structure that guides Summerset Royal Navy safely through the night. The cliff that it is built upon provides a lovely view of the holy isle of Summerset. On a particularly clear day, one can see the town of Shimmerene from its top, which is restricted to be visited by outlanders. Although partially destroyed in 2E 582, it was rebuilt the following year. 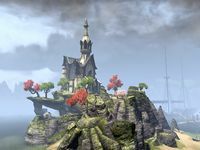 The mysterious island of Dranil Kir, once occupied by the Psijic Order, is located just off the coast of Vulkhel Guard. Unnatural storms are common around the waters of the islands, so sailors avoid it. 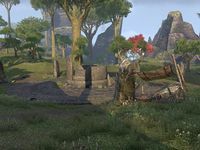 Few mainlanders had set foot in the Summerset Isles, and Vulkhel Guard have always been the most cosmopolitan port in the Isles since the early First Era, when it was probably founded. Even during the few years when Summerset Isle was open to commerce and travel by royal decree of Queen Ayrenn in 2E 583, Vulkhel maintained its status as a prime seaport. After the Soulburst of 2E 578 (or 2E 579), which sundered the veil between Nirn and Oblivion, and disrupted the connection between the souls of the denizens of Nirn and their mortal hosts, come the Planemeld, a massive Daedric invasion of Tamriel by the Daedric Prince Molag Bal in the year 2E 582. Just outside the town of Vulkhel Guard he used one of his Dark Anchors, huge Daedric interplanar machines, in an attempt to drag Nirn out of Mundus and into his own realm of Coldharbour. 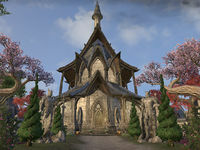 The so-called Iluvamir Dolmen was destroyed multiple times by the Auridon Chapter of the Fighters Guild, not without local complains about outlander interference in Summerset affairs. The Planemeld was ultimately prevented by the forces of Meridia, the Soulless One and the Eight Divines. After the formation of the First Aldmeri Dominion and with the start of the hostilities in the mainland, the town received even more visitants from Valenwood and Elsweyr, some of them, immigrants who wanted or needed to establish themselves in Auridon. Many came to work on the fisheries and to collect clams and other shellfishes along the bountiful coasts of Vulkhel. However, not even the Three Banners Wars restricted civilian travel from Vulkhel Guard to the territories of the Pact or the Covenant. And, with new allies, Vulkhel Guard strengthened their trade routes to Valenwood, exporting local seafood and fish, their main products, heavily valued by the Bosmer; but also meat from the farms of Greenwater Cove and steel, weapons and armors from Mathiisen; and importing Bosmer crafts, seen as primitive art by the Altmer, but also mostly valued. However, with the Dominion, came the Thalmor, who began to threaten harsh punishment toward their detractors. Vulkhel Guard was the first town Queen Ayrenn visited on his tour through Auridon after the formation of the First Aldmeri Dominion. Most of the citizens were excited about the event, their administrators and their servants were very busy, while the atmosphere turned festive. Due to this, security tasked to the First Auridon Marines was hardened. The Watch Captain of Vulkhel Guard, Astanya, was tasked with most of the new duties. However, she and most of the town watch were plotting with the Veiled Heritance to try to murder Queen Ayrenn during her public appearance. The Eyes of the Queen, lead by Razum-dar, finally foiled Heritance's plans and Astanya was slain in the Temple of Auri-El by the Soulless One as she did not surrender. The Soulless One became an Eye of the Queen thereafter, a title bestowed by Queen Ayrenn herself. When local criminals, organized under the name of the Shadow Artisans, noticed that the Veiled Heritance was engaging in thievery and the fencing of stolen goods in Vulkhel Guard, refrained from any and all dealings with this group, as drawing the attention of the Eyes of The Queen upon their own operations would have been foolish and unnecessarily risky. So, their business was not welcome in the town, and the presence of their operatives was not tolerated. Parallel, agents from the High Kinlady Estre, the Veiled Queen, occupied Del's Claim tunnels just off Vulkhel Guard, the richest mine in all of Auridon. However, their agents were eliminated by the Soulless One. Although most thought by the Second Era that Vulkhel Guard was well defended against attacks from the Maormer, it faced a failed invasion by Admiral Heculoa with Veiled Heritance's support. They set up a camp in the beaches west of Vulkhel Guard and held First Auridon Marines hostage at South Beacon, a resource, which they were going to use to blackmail Queen Ayrenn when she arrived to town. Once they took the lighthouse, they began signalling more ships to come to have the numbers they needed to move on and invade Vulkhel Guard. The Soulless One, with Marines' support, rescued the hostages, dismantled the invasion and destroyed the top of the lighthouse to stop signaling. After the Daedric invasions of both Mehrunes Dagon and Molag Bal, and the subsequent destruction of most of Firsthold in 2E 582, certain reference works were lost from the great library, so Kinlord Rilis XIII asked the leading experts of Auridon to replace them with new accounts, and the Armorsmith Peerless of Vulkhel Guard was intended with the definitive description of the classical Altmeri Glass crafting style, proof, of the great skill of its smiths. By the time of the Imperial Simulacrum, Vulkhel Guard was still a vibrant town, being under the rule of Duke Mithra. It had a rivalry with West Guard. However, by the Fourth Era, it appears that Firsthold had replaced Vulkhel Guard in its role as main trading port with the mainland. Vulkhel Guard has been an integral part of the realm of the Summerset Isles since its foundation. A Canonreeve is tasked to rule the settlement. As the least restricted seaport in the Summerset Isles, both mainlanders merchants and immigrants commonly enter Auridon through this port town. Vulkhel Guard's townsfolk are well accustomed to dealing with traders, travelers and immigrants. The innkeepers are known to be polite guests and to serve local fare "with no equal in Tamriel". Despite this hospitality, travelers are recommended not to wander too far from the town limits. 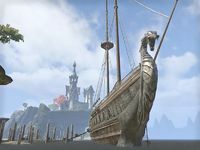 Vulkhel Guard also serve as the main link of Summerset Isle with the rest of Tamriel through the port city of Shimmerene, ferrying goods and citizens to and from Auridon. Even in this open port town, any stay longer than five days must be approved by the Auridon authorities or be faced deportation. 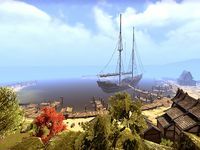 Trade feeds Vulkhel Guard "like rain feeds a tree", so it is regarded as the main economic activity of the town, being the seaport with most loaded cargo in the Summerset Isles. Vulkhel Guard also serves as a hub for smugglers between Auridon and the mainland, mostly Elsweyr, because the laxity of their cargo inspectors, who are also rumored to be corrupt and steal part of the tariffs. 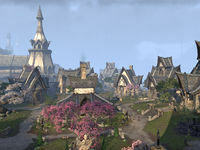 Although on the surface, the town seems friendly towards foreigners, some local Altmer, mostly of noble descent, still despise other races' presence in Auridon, specially during the formation of the First Aldmeri Dominion, when many Bosmer and Khajiit come to live and trade in Vulkhel Guard. They usually bully and insult the impassive immigrants, and are even capable of calling the Dark Brotherhood to killed some of them. Fishing is the second most important economic activity in Vulkhel Guard and exports many of their catches to Valenwood. Many Bosmer and Khajiit work as fishers in the docks and ships of the town. So that is that local Altmer are discouraged to do that manual work. Just outside Vulkhel Guard, a local by the name of Del found a huge deposit of lapis lazuli up in the hills, which turned to be one of the most profitable mines on Auridon. Vulkhel Guard smithers, lead by their Armorsmith Peerless, are expert on the crafting of the traditional Glass armors and weapons of the Altmer, second only in expertise to the ones in Firsthold, where the technique originated. Painters of both portraitures and landscapes from Vulkhel Guard are also most appreciated in the Summerset Isles and beyond. They are lead by their Master of Portraiture, a very prestigious position among the wealthy and nobles, who invite him or her to attend all sorts of dinner parties and galas. Most of the buildings in Vulkhel Guard are made from marble and tall spires dominates the skyline of the town. 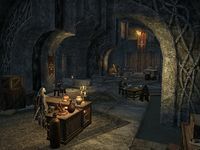 Before the dissolution of the Mages Guild following the Oblivion Crisis, Vulkhel Guard had a large Guildhall, comparable to those in Skywatch and Firsthold. The Fighters Guild had an important presence in the town by the mid-Second Era too, however it is unknown if the organization survived after the formation of the Third Aldmeri Dominion. The Temple of Auri-El in Vulkhel Guard was the largest and most important of the Summerset Isles by the time of the formation of First Aldmeri Dominion consecrated to the chief-god of the Altmeri Eight, and it was the place where his High Priest reside. The temple and its surroundings are regarded as one of the most beautiful spots in all of Auridon.